These past two days, we’ve looked into Chevy and the Chevy small block’s past and present, and between these time periods and products is a singular emotion. What joins the creation of the small block, the history of General Motors, and events like the Woodward Dream cruise is passion. Passion is not merely performance numbers, fuel economy, or just design alone. It’s the melding of the three parts by groups of people to create great products that they are proud of. On top of that, it then appears with the customer and how they interact and love the product. You can’t engineer or design a passionate car on purpose, just like you can’t create a perfect spouse. It’s all about the process. 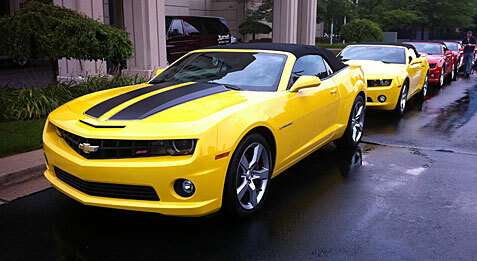 A car that elicits response from owners and passerbys is one that was created with a genuine care for the result. It is the result of this continual effort that creates the story of these cars and makes them more than just pieces of metal. You see this passion in the creation process when you visit GM’s Heritage Center. Surrounded by the significant cars of the past, you see the thoughts and dreams of car designers that ended up in the final process. From a design and engineering standpoint, you can feel what their creators and teams were thinking when they created these pieces. You see a visionary mindset that is not stuck in the past, but it always pushing through to the future. These designers and engineers were not only looking for performance, but also at fuel economy and evocative design as well. For instance, the 1953 Firebird concept used turbines in an attempt to get both performance and fuel economy. Plus, it was stylized like a jet. It was not a dowdy economical box to suffer in while you squeezed out every drop of gas. Fuel economy, to the designers and engineers, was just another boundary to push the envelope like performance, and it was another tool to capture the buyer’s attention. The first day was all about the history and pedigree of the Chevy small block. Today, we experienced how the small block is being used nowadays and a firsthand account of cruising on Woodward. We started the day at the birthplace of ZO6, ZR1, and Grandsport Corvette motors. Then, we cruised Woodward in the Chevy parade and ended the day by sampling applications of the small block in both Chevy cars and others. The GM Performance Center is where traditional craftsmanship and modern attention to detail meet to create some of the highest performing motors on the planet. Here, every 430hp Grand Sport motor, 505hp Z06 motor and 638hp ZR1 motor take shape. Each motor is built completely by hand and signed by the technician that builds it. To ensure correct specifications, advanced torque wrenches are used to give the builder a guide when each individual fastener is bolted to the motor. In fact, each bolt’s torque is registered in a massive database for each engine to ensure quality even after the engine leaves the factory. No other facilities offer this level of attention to detail, not even many of Mercedes’ AMG engines. Not only is every motor built by hand, but if you partake in the Build Your Own program, the hands that build your Z06, ZRI or Grandsport motor could be your own. For $5800, you can visit the performance center, and with the help of a qualified GM engine builder, build your own motor. At the end of the process, your own name will appear on your engine’s build plate. If there’s one automotive pilgrimage that must be made by gearheads everywhere, it’s the Woodward Dream Cruise. Located in the automotive Mecca of Detroit, MI, the Woodward Dream Cruise is a weeklong event that celebrates the religion of cars. The Dream Cruise specifically worships the sect of classic American muscle cars with big V8’s, aggressive lines and bad attitudes. All cars are welcome, but these vintage American hulks from a bygone era reign supreme. Today was the calm before these cars are awaken from their slumber and marched towards Woodward Ave. Every year brings something unique, and this year is no exception. This year’s Dream Cruise marks not only the year of Chevrolet’s centennial anniversary, but also the 100 millionth small block Chevy V8 to be produced. 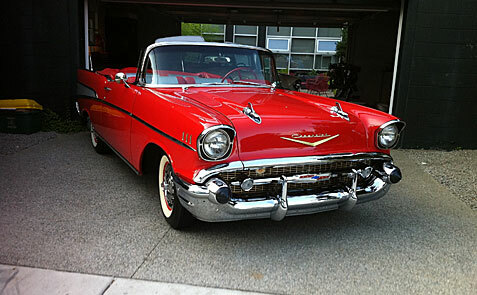 If there were one spokesman for the entire muscle car movement, one defining piece, it would be the Chevy small block. 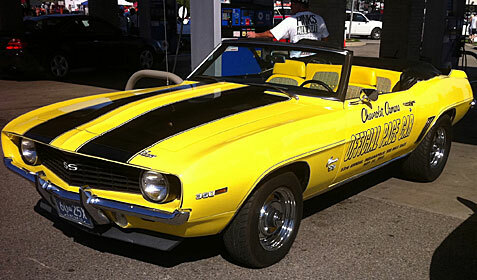 There is no better place to pay homage to this piece of engineering than the Woodward Dream Cruise. The mission of the Chevy small block was simple: create an affordable engine to bring the power that the marketplace demanded. In 1955, chief engineer Ed Cole completed that task. The result was the Chevy small block.